Could you be paying less for heating and cooling in Bloomington, IL? At Residential Electric Heating, Cooling & Insulation, we help budget-conscious, environmentally responsible home and business owners achieve freedom from sky-high utility bills and enjoy greater comfort indoors. What you don’t know about your existing insulation could be costing you hundreds extra in energy bills each year. Spray foam works by filling in all the cracks and crevices and expanding to eliminate air movement, which is the main cause of energy inefficiency. And at Residential Electric Heating, Cooling & Insulation, we offer quality spray foam insulation for local homes and businesses alike. If your property isn’t properly insulated, you’re overpaying for energy and overworking your HVAC system. But with spray foam insulation from Residential Electric Heating, Cooling & Insulation, greater energy efficiency and lower heating and cooling bills could be just a phone call away. At Residential Electric Heating, Cooling & Insulation, we pride ourselves on top-quality products and outstanding service. We believe that our customers deserve nothing less than the best, and our commitment to excellence is reflected in everything we do. 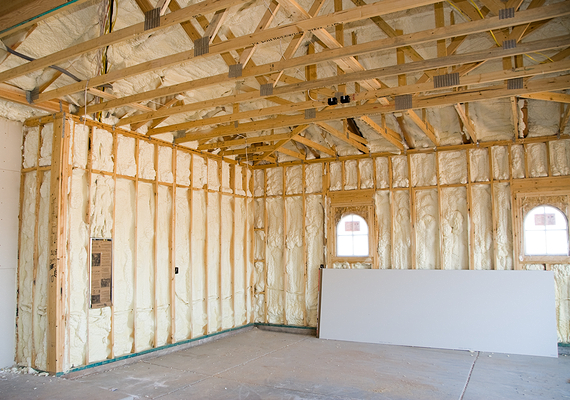 Cut your costs with spray foam insulation from Residential Electric Heating, Cooling & Insulation. Contact us today for an estimate.